It was a gargantuan job to organize the reference for this art featuring 2011 Westminster Dog Show winner GCH Foxcliffe Hickory Wind, a.k.a. "Hickory," a majestic Scottish Deerhound. Once I got to drawing, however, it was a piece of cake. I particularly like the overlaying circle and box elements at the center, in imitation of Leonardo’s Vitruvian Man. Like the Vitruvian, Hickory is a creature of impeccable proportions. 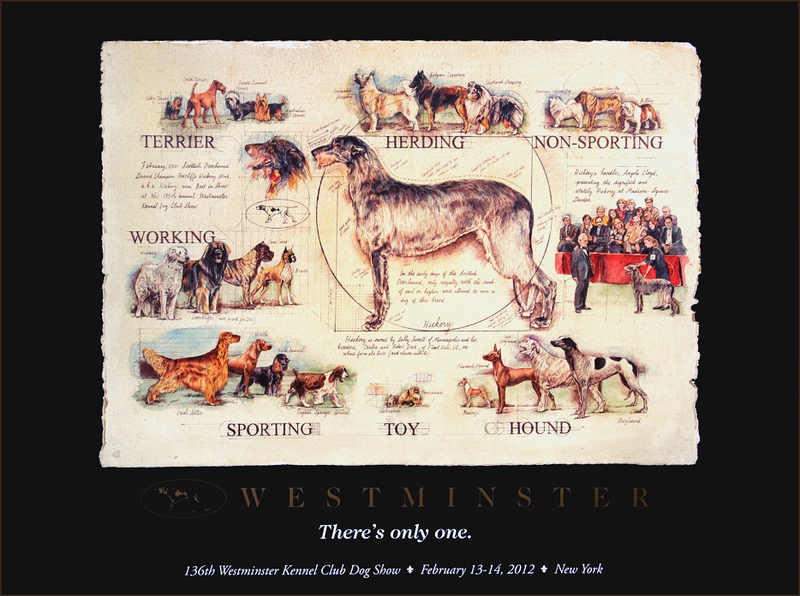 I spent two days signing posters of this art at the 2012 Westminster Kennel Club Dog Show at Madison Square Garden in New York City. Please see my News update about the show. I am proud that my poster was their most successful poster ever - that is, until the next two posters I did for the Westminster Show. While signing prints, I met Hickory's Virginia owners – a true highlight of the experience.